COMPLETE Machine Tools is offering a full CNC press brake, at an affordable price, without compromising quality and reliability. The CMT line of CNC press brakes is suitable for the company that traditionally uses a conventional press brake and is looking to upgrade to a faster machine with state-of-the-art technology without having to pay an exorbitant amount of money or the company that uses CNC press brakes and is looking to upgrade. The hydraulic system is from German manufacturer Hoerbiger Hydraulics. This system has proportional valves that control the amount of oil fed into each cylinder for accurate bending. The control system is by Delem of Holland. This control has graphical and numerical programming and tool libraries that can also be viewed graphically or numerically. It is an extremely powerful control but the best part is its simplicity. The programming side is easy to learn making training a breeze. The control has a USB port for easy back up of programs and tooling libraries and can also be networked to the office for programming on a PC. A screen conveniently located at the bottom of the control can be used for making slight adjustments while bending so the entire program doesn't need to be changed. A 2D control is standard but has the option to be upgraded to 3D. The back gauge is extremely fast driven by a Panasonic servo motor and the accuracy ensured with linear guides and ball screw. The linear scales are Heidenhain from Germany which measures the up and down stroke of the bending beam. Linear guides for the sheet supports are a standard feature making the movement of the front sheet supports quick with smooth movement. Hydraulic crowing (C axis) of the bottom beam is a standard feature and this ensures a perfect bend every time with no deformation of the material. With conventional press brakes the ram will deflect opposite to the bed causing bending variations along the part, with the CMT CNC press brake the bed automatically deflects parallel to the ram under CNC control through the use of a triple structure table incorporating hydraulic compensation cylinders ensuring consistent bend angles along the entire work piece. Tooling setups are configured to the customers requirement, a multi-vee wide worktable, single-slotted vee, twin-vee combination or a combined bottom die are available. The clamping system of the top tooling is a quick release system which has a handle that releases within seconds and the tooling can slide out quickly for fast tool changing. Wilson super quick release system is also available as well as hydraulic top tool clamping system as an option. 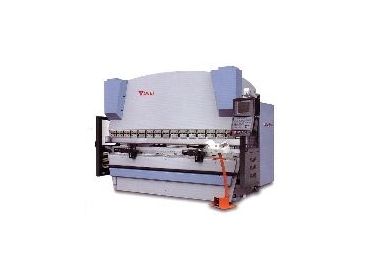 Many other options are available on the CMT CNC pressbrakes, the back gauge can have up to six axes controlled by servo motor (X1, X2, Z1, Z2, R1, R2) and servo driven front sheet supports for supporting the material while bending. A large range of CMT CNC press brakes are kept in stock for quick delivery and can be demo’d for customers at a moments notice. A huge variety of sizes are available from 80-ton to 1200-ton and varying in bed length of 2250mm up to 8200mm. Machines can also be set up in tandem if bigger tonnage is required and more bed length is needed.